Kagome Higurashi is a high school girl, who isn't too great at studying. One day, when trying to retrieve her cat from her family's Shinto shrine, she discovers a new world, Japan in the Feudal period. 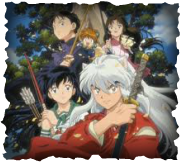 She meets a half demon called Inuyasha, and they, along with Miroku, Sango & Kirara, and Shipo, try to collect the shards of the Sacred Jewel. Kagome discovers she is a reincarnation of Kikyo, who was Inuyasha's previous girlfriend. A high school girl named Himeno Awayuki is trying her best to fit in with her new, rich family. But her sisters hate her and her new step-mother seems to find her disrespectful. She feels more alone then ever before, with her new school and huge new home. Everyone thinks her dad is just marrying Natsue Awayuki for her money, but he isn't. But when she meets the Leafe Knights, and discovers her identity as the Pretear, things start to look up. They fight against the evil forces of Fenrir, Princess of disaster....Who was the previous Pretear!? Maron, a high school girl, is a rhythmic gymnast, who can transform into the legendary Kaitou Jeanne. When she was little, she'd been abandoned by her parents, which is also the reason she lives alone. She is a well liked girl and has plenty of friends, including Chiaki Nagoya and her best friend Miyako Todaiji, who is the daughter of a police detective. Maron works undercover, a well known "Thief" for stealing paintings, which are actually possessed by demons. She checkmates the paintings along with her partner fin, and competes with Sinbad and Access, whom she believes is evil. But the person who is evil is actually.......Fin!? Mikan Sakura is a popular ten year old girl who lives with her supposed Grandfather. But when her best friend Hotaru transfers to Alice Academy, or "Gakuen Alice", a school for talented children, she decides to follow. She discovers that Alice Academy is actually a school for people with Alices, a special power, and that she has the nullification alice. Her best friend Hotaru has the invention Alice. On her first day, Mikan meets the infamous "Natsume Huuga", who was attempting to brake out of school. 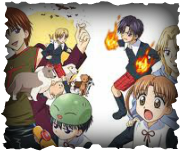 Miaka Yuki is a middle school girl who is determined to go to Jonan Academy, though her friends don't believe she will. Yui Hongo, her best friend, is applying for the same school, but has a much higher chance of getting in, as she is much smarter. One day, Miaka and Yui are at the school libary, and when Miaka is buying something from the snack machine, she sees a red bird. She believes it is a illusion, but follows it, and finds a hidden libary. They discover a book called "The Universe of the Four Gods", and are sucked in, except Yui is immediately sent back. They both start to love Tamahome, the Orge of the Suzaku Seven. 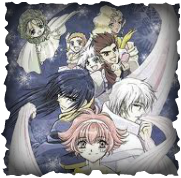 Miaka becomes the Priestess of Suzaku, and when Yui is sucked in for the second time, she becomes Priestess of Seiryuu by choice, because of the jealous and humiliation she feels towards Maika.. Yui and Miaka oppose each other, driven by personal reasons.